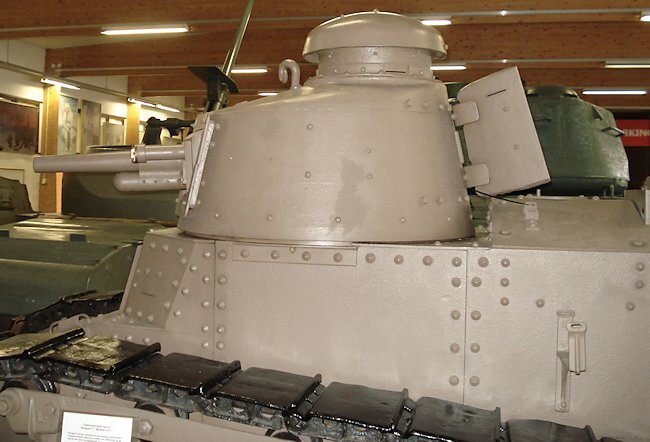 This Preserved WW2 Finnish Army Renault FT Tank can bee seen at the at the Armour Museum, Panssarimuseo in Parola, Finland. The Finns added a tool box on top of the suspension beam and a curved return roller metal bar along the length of the top section of track where French versions of the tank the bar is straight. 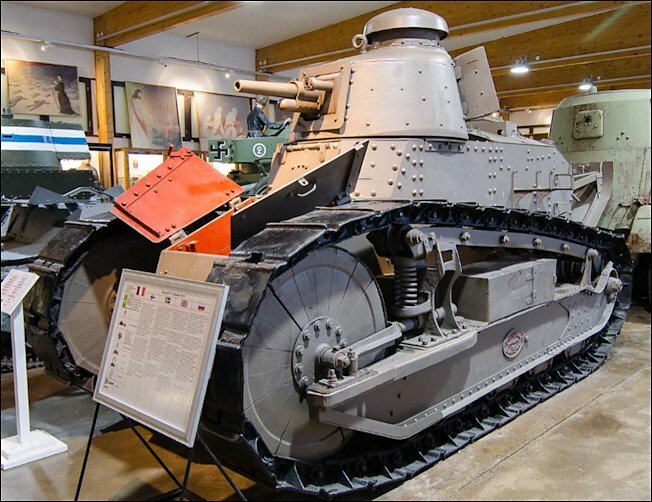 This Renault FT17 tank is on display at the Finnish Armour Museum, Panssarimuseo in Parola, Finland. The Museum is to the south west of the town. It is 143 km north of Helsinki roughly a 2 hour drive up the E12 motorway. Set your Satnav for Parola. Turn off at junction number 27 on the E12. It is sign posted Hattula and Parola. Do not turn right to Parola. Turn left and follow the sign marked Parolannummi on the 3051 road. A few kilometres down the road you will see on top of an embankment on your right, a black steam train and a row of armoured railway wagons with the Finnish swastikas painted on them. Turn right at the next road. That will take you to the museum entrance. Look for the brown tourist sign with the words 'Panssarimuseo Armour Museum' on it and the Sherman tank at the gate. You can catch the train to Parola direct from Helsinki. It is only a 1.8km walk from the railway station or you can take the number 5 bus. Be careful if you decide to walk as there is no pavement for a good stretch of the route. This surviving tank was armed with a 37mm SA-18 (L/21) tank gun and carried 233 rounds of ammunition. Earlier versions were fitted with a 8mm Hotchkiss machine gun and later a 7.62mm M/09-31 machine gun. The two man crew were protected by armour that ranged between 6 - 22 mm thickness which was only designed to stop small arms fire and shrapnel from exploding shells. It offered little protection from enemy tank armour piercing rounds. You have to remember that this tank was designed in WW1 were tank on tank combat was not envisaged. It was powered by a Renault 4 cylinder gasoline petrol engine that produced 35 hp which gave this little tank a maximum road speed of only 7.7km/h (4.8 mph). It only had an operational range of 35 km (21.7 miles) before it needed refueling. At the start of the Winter War in 1939 it was obsolete. The Winter War was against the Soviet Union 30th November 1939 to 13th March 1940 -tentatively support by Sweden, Britain and France and lesser extent USA. Russo-Finish War also called the Continuation War, Germany as a co-belligerent June 25, 1941 – 15th September 1944 and finally the third phase the Lapland War 15th September 1944 – 25 April 1945 Finland aligns with Soviets against German forces in Finland and Swedish Lapland. Finland was part of Imperial Russia until the 1917 Communist Revolution. At the end of WW1 when it gained independence. This new country realised that it needed to obtain armoured fighting vehicles to protect its borders. 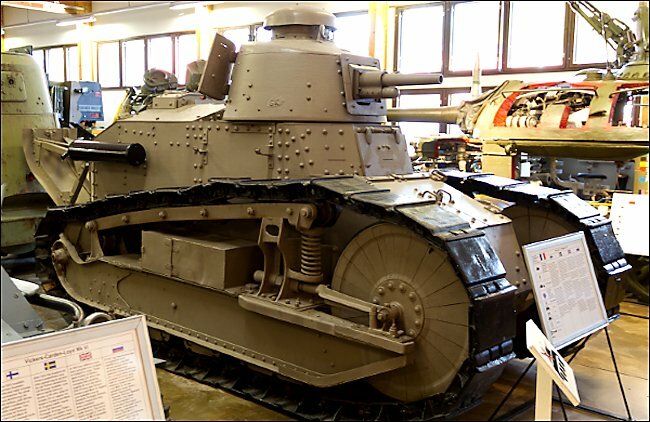 France had a lot of Renault FT 17 light tanks that it no longer needed after the end of the Great War. They negotiated to buy 32 tanks from the French. Only fourteen of these tanks were armed with the 37mm SA-18 (L/21) tank gun that could fire armour piercing rounds. 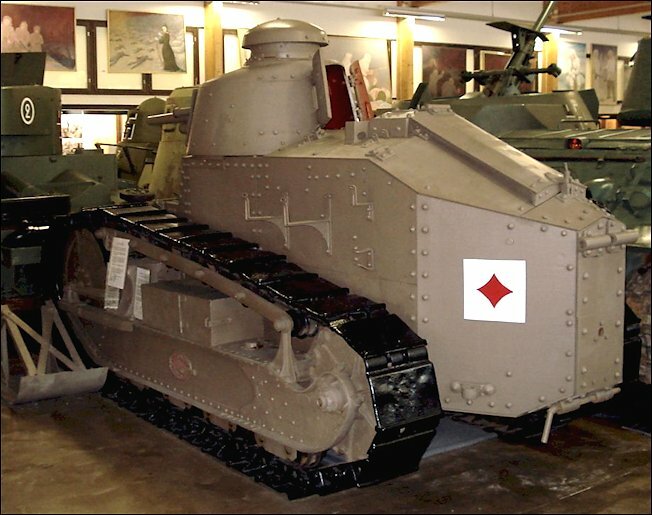 The other eighteen tanks were fitted with only 8-mm Hotchkiss M/1914 machine guns. It was envisaged that the machine gun firing tanks would work with the 37mm gun tanks to give each other mutual support when dealing with enemy attacks. A few had the original angular riveted turret but most had the newer circular Berliet turret. In November 1939 the Soviet Army invaded Finland in what was to become known as the Winter War. 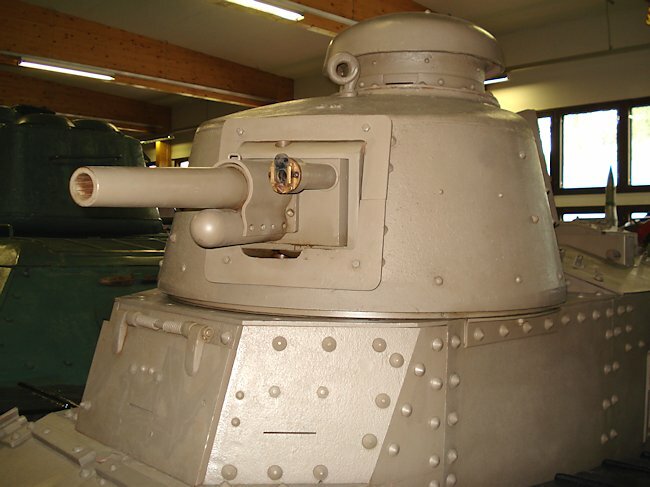 The WW1 Renault FT tanks were the main core of the Finnish Army. Out of the four armoured tank companies of the Finnish Tank Battalion, that were available to be deployed to face this new threat, two of them were equipped with obsolete Renault FTs. They were ineffective against Soviet T-26, T-28, BT-5 and BT-7 tanks. 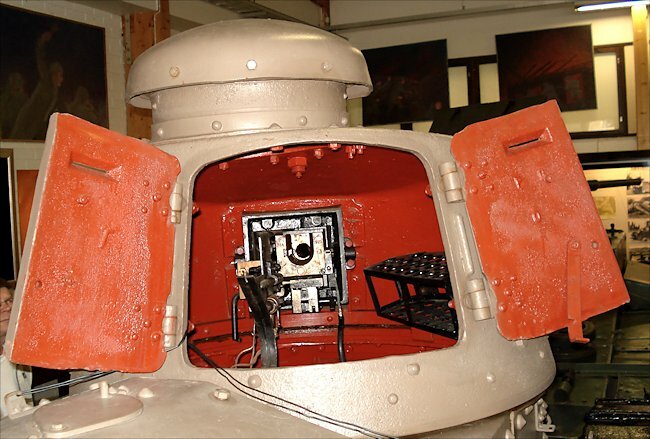 The tank's turret was the most heavily armoured part of the vehicle and the curved armour helped deflect incoming shells. A decision was made to bury the hull of some of the tanks leaving only the turret visible and use them as defensive pill boxes. Others had to be abandoned when the Soviets broke through the front line. After the Winter War armistice only four of the original 32 tanks were left in working condition. They were used as training vehicles at the Finnish Army tank training school until 1943. Some of the tanks were kept in their original French army camouflage paint scheme but a few that went in for repairs in the 1930's were painted brown by the workshop crews. Metal tool boxes were fitted on both sided, above the lower tracks on the Finnish Renault FT17 tanks. The tank driver sat in the centre and at the front of the vehicle. In the above photograph you can see two large handles. These opened two large hinged hatch doors. The Armoured top hatch had to be opened as well for the driver to get in to the tank. His vision was very limited in battlefield conditions. He only had three small slits to look through. one to the front and two left and right at 45 degrees. He was very venerable to armour piercing rounds fired directly at the tank. The armour plate was not thick enough to protect him from anything other than small arms fire and shell splinters. Finland along with the British and French lent some of their WW1 vintage tanks to the Royalist White Russians to fight the Communist Red Russians in the north western battlefields of the Russian Civil War. With the Communist victory those tanks that survived were transported back to Finland.